Is my Hermann's tortoise ok? I have had a Hermann's tortoise called Tommy for about 3 years. He has a slightly weird shaped shell but apart from that he seems to be OK. He eats apple, strawberries, lettuce, and a dried formula from the pet shop. He has a big cage with proper heat and a big sun lamp, but he does not seem very happy. All he does is eat and sleep. I was wondering if he is OK and what I can do to make his life a bit more interesting. Do I need to get him a friend? I did hear that if I got another tortoise then they would fight? please help as I am worried about him. I'm glad you sent a picture of Tommy. That will help other people to answer your question. The easy part is to say that unless a tortoise wants to mate, another tortoise won't improve the situation. You didn't say whether Tommy's behavior has changed. If it has, you should find a veterinarian to get him a check-up. I'm worried that Tommy might be eating too much fruit. Check the list of tortoise food for suggestions. Also, ask yourself if he has anything interesting to do in his home. For example, have you ever tried putting his food just above his normal reach so he has to stretch or climb just a little to get it? Maybe he just needs some variety. Comments for Is my Hermann's tortoise ok? Yes, you can keep a male and a female together. What you must do is provide a place for one to get away from the other if one becomes aggressive or one simply wants some privacy. Hello:we have a girl Herman tortoise and we would love to get another , however we are not sure a male and a female would get on together , what is best? My tortoise sometimes has that, tiny bits of skin coming off, I think it's just natural as they grow some skin scales come off. I have a Herman tortoise and she Ihas some skin on her head that is slowly coming off , what should I do? Do not put a pregnant tortoise into hibernation. ok so maybe getting another tortoise for tommy is a good idea and do not feed him lettuce or apples because that's not that good for tortoises and only feed him strawberries only every once a while. some things to feed him is kale, mustard greens and/or water crest and another thing maybe the reason he is deformed is because of what your feeding him. his shape is probably just the way he was born, so don't really worry so much about him. Another thing if you do get another tortoise, first of all I would recommend it because he may be happier, but if they mate you will have to put them in the refrigerator to put them in full hibernation. You may not believe this but my little granddaughter put lots of Peppa Pig stickers on one side of her table (which we keep on the floor so she can nip off if she wants to). Anyway, she seems to love the stickers and spends ages gazing at them. Its really strange cos I never thought a tortoise would even notice stickers - anyway she loves them - try it, it might be an interesting distraction!! Fruit should never be fed to Mediterranean tortoises,you need a good quality 10-12% uv strip,best on the market is the Arcadia t5 d3+ 12%.use neckton msa suppliment as better than nutribol and should give a light dusting on thier food each day!substrate should be deep topsoil which needs to be damp so they can burry down at night which is vital for hydration and smooth shell growth!should be hibernated every year if safe todo so! People need to know the even basics before even thing of getting a tortoise! I noticed my son's tortoise is getting a long beak. Is he getting to much of something? He is seven years old. No, it looks like your Tortoise has metabolic bone disease. Your tortoise is not getting enough calcium and vitamin D3, you need to supplement your tortoise every day with nutabal. You need a D3 heat lamp. I recommend solar glo exo-terra. This is the cause of the odd shaped shell. You shouldn't be feeding them strawberries or apple much. About once a month as a treat or not at all. You should feed them on mostly weeds, like dandelions. And salad- romaine lettuce, cos lettuce. Prickly pear cactus is great for tortoises. NEVER FEED TORTOISES WITH PET SHOP BOUGHT TORTOISE PELLETS. I have just purchased a 5 year old female Herman tortoise from a pet shop she was in a viv and desperate to get out, I brought her home to a lovely large garden, but she hasn't hardly eaten and I am concerned as down the middle of her shell there seems to be pointed shapes. She may be eating weeds when she is walking around and I haven't seen her. I bring her in at night, perhaps she is just settling in to a new life, a much better one than the pet shop. thank you for the pic i have a hermann's tortiose too. I have a hermans tortoise and he is around the same shape as yours, my tortoise has a calcium deficiancy and has had septicimia. You should consider taking tommy to the vets to be checked as they would give you more information about Tommy. Apparently hermans tortoise's dont really get lonely. If you wanted to make his cage more exciting then i would suggest for you to put in some logs and peices of slate. also you should search the internet for tortoise books. Thank you so much for updating us on Tommy's condition. I hope you noticed that I removed the worst of the Anonymous comments. I agree that you should not be yelled at for asking questions. I think all questions mean someone wants a tortoise's life to be better. Tommy is lucky to have you taking care of him. And I'm lucky you have hung in and keep us updated. The posts here will help other tortoise owners. Well, anonymous, not surprised you chose to keep that name! While the tortoise in question has clearly had a poor diet and accomodation and possibly not enough uvb D3, I would hardly go about telling the owner in the manner that you did - why not put some pics up of your own tortoises and lets see how perfect they are ;) This little one possibly has a degree of MBD but without x-rays and bloods it's impossible to say for sure and although it is clearly not a perfect shape it could well make a nice adult tortoise with a lot of TLC and a good exotics vet check up. A tortoise should NEVER be kept in a viv!! they should have a tortoise table and a outside pen for hot days. they sould also NEVER be fed fruit as it is not good for them. they should be fed on weeds that have been sprinkled with nutrabol! Your tortoise is suffering pyramiding of the shell which is ireversable! it is due to the diet you have fed him! go to the tortoise trust and do some research. ***Comment removed by Shelly. We use only polite language here. You have good information to share. You may not call names. Shelly*** and yes i am a know it all, as i have bred hermann's tortoises for 23 years! Hi,I have a number of reptiles ranging from tarantulas to chameleons,and of course theres Shelby,my Hermann's tortoise,She is around 2 years old now and is fantastic! We keep her in the front room in a tortable and she loves it,she loves to see whats going on and likes to watch my son running around! I Do give her fruit now and again,maybe once a week but she loves her dandelion leaves. Another thing I would suggest to put in your tortoise's viv is rocks,Shelby loves climbing over then,obviously they arent too big and high that she can hurt herself but she loves it,I also put in sum artificial flowers,something thats eye catching for both people and the tortoise. There are real potted plants that you can put in but you have to check which ones are ok. I also made a small soil area for her to go in,which again she loves,I then made a small rocky area (with pebbles). These are just some suggestions of what you can do,and i am sure he will like them! No tort should be kept in vivariums...its not right. They should be kept in tortoise tables where the air can breathe all around them. Diet in the main thing with a tort...you should feed them on weeds...dandelions, vetch, plantain, white and red clover...all things like that. Go onto the tortoise trust website and download the weeds for torts to eat. After reading some comments on here it has really upset me...it doesnt matter about having a friend...what will happen when they start to mate??? They are perfectly happy to live on their own. 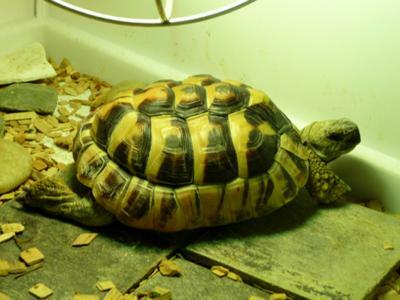 I have 9 and am taking on a re-homing tort in 2 weeks cus he has had a bad diet and needs a good loving home. Please please read the TORTOISE TRUST site for all your info. I am re-homing another tort in 2 weeks...a hermman with a deformed mouth due to being fed on berries etc..and living in a VIV...dont please keep your tort in a viv...think and ask yourselves..where do they live in the wild??? an open top tortoise table is brilliant until they get bigger and need more space. Hey, thanks for the reply, i might just do what you suggested and get him a pal, although he does seem happier these days as i built him a bridge that he sits and keeps watch on.... I will keep you updated if i can find 1 that's 5 years old. maybe someone knows where there is a rescue one i could look after? No, his behaviour has not changed. He does walk around his cage a lot. Perhaps I am being over concerned about him, but I will try your suggestions about moving his food and try some of the other foods mentioned in the sheets. It might be that he just gets tired out as he is still only little. He is only 4-5 years old. Your tortoise will love wild grass and wild flowers. Be sure there are no pesticides on them.